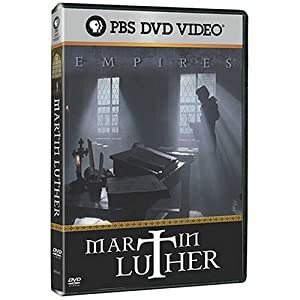 Last night, Roy and I watched a PBS DVD on Martin Luther. Excellent. I don’t know when we have last had to pause a documentary because we were laughing so hard. We found the comments of the scholars hilarious. The documentary goes through Luther’s childhood with unloving, lower middle class, but ambitious upwardly mobile parents who wanted him to become a lawyer to fulfil their dreams for him. After a dramatic conversion, during a lightning storm, he commits his life to God. (Good move!) “My father raged and acted like a fool. How was he to know that one monk in the family would bring him more fame and shame than a thousand advocates.” Luther writes. And so he throws himself in a regimen of praying, fasting, confessions, whippings, watchings. He says, “If ever a man could be saved by monkery, it would have been I. If I had continued any longer, I would have killed myself” He later blamed his ascetic practices for permanently ruining his health. He is disgusted by the worldliness, extravagance and cynicism, he sees on a trip to Rome as a young monk, and for the first time starts doubting Catholic teachings–in particular, the buying of indulgences to rescue a soul from purgatory. The floodgates of doubt open. “Who knows if it is really so,” he wonders. Von Staupitz appointed the young monk Professor of Bible Studies in the new university of Wittenberg, hoping it would provide a distraction from Luther’s recurrent theological brooding and devastating introspection. Von Staupitz’s plan, modern scholars say, was that Luther would be so shattered that he would no more time for guilt and introspected, and would collapse and sleep soundly. Work always operated on Luther as Prozac. In this case, studying scripture shows Luther that the Catholic church taught much that simply wasn’t so. He realized: This whole thing is not about you and the church. It’s about you and God. Salvation is a gift from God, a gift received through faith. The church has no right to intervene or interfere. To receive salvation, you simply put out your empty, open hands and receive this gift which God wants you to receive. We all need to come to this realization, and when we come to it, there is a great revitalization of our spiritual lives, and fresh joy and peace. The church should never take the place of Christ as the protagonist of the central drama of our spiritual lives. If/when it does, our faith is fair on the way to becoming toxic. And so, in accessible language, Luther writes the 95 Theses, the blog posts of the day. He attacks the Church’s excesses, in particular, its greed in the sale of indulgences. If he had attacked their theology, they may well have ignored him. But he got them where it hurt–he encouraged people not to give it their money. 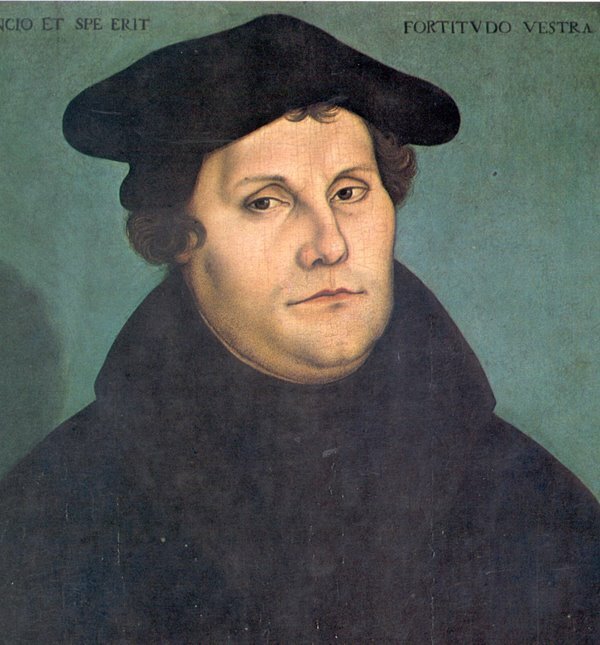 Big Business–The Catholic Church of Luther’s Day. “I never thought that such a story would rise from Rome over one little scrap of paper! ” Luther wrote. For Martin Luther, the mounting fury of the Catholic church inspired not doubt and fear, but an extraordinary courage that would only grow stronger with every attack he faced. He had the strong idea that if the Christian life was lived authentically, then you must expect to suffer. Luther seized the criticism of him almost as a confirmation of his vocation as a reformer. The more the church tried to silence Luther, the more he became convinced that he had a vocation which needed to be seen through. Despite the Papal Bull of excommunication, despite the fact that his life would be in danger if he fell into the hands of the Catholic Church, Luther continued with his attacks on it. “I decided to believe freely and to slave to the authority of no one , whether council, university or pope. I was bound not only to assert the truth but to defend it with my blood and death,” he wrote. He had an extraordinary combination of high idealism, resolve in the single-minded pursuit of an ideal, and naivete!! Luther squared up to the church with a style of opposition it had never encountered before, a surprisingly modern style of opposition. He discovered a new and powerful weapon on his side–the printing press. For movements to spead, their ideas needed to spread. The printing press invented in Germany by Gutenberg 30 years before the birth of Luther was to Luther’s day what the internet is to our day. It meant that ideas could travel. They could not be stopped. As the presses spread his 95 Theses throughout Germany, Luther watched and realized that they could provide him with a vast new audience. He next wrote, “An Address to the Christian Nobility of the German Nation,” a devastating attack on the pope and the church. He attacked the number of secretaries the pope had provided by German tithes (a criticism which could be levelled at some of the princelings of our modern churches). Alistair Macgrath—”He wrote very well, he wrote very wittily, he wrote very rudely. Many people found themselves fascinated with this man who would use such crude language when arguing with the Pope and with the church. Luther started something that snowballed throughout Germany. Luther was summoned before the Holy Roman Emperor, Charles V at the famous Diet of Worms. Cardinal Aleander, representing the Pope, showed Luther a pile of his books, and asked him if he wrote them, and was willing to recant. Interestingly, for he was just a human being after all, and one potentially facing death at the hands of an unjust institution, he asks for 24 hours to consider his response. Which is famous. One of history’s greatest declarations of exhausted defiance!! Luther’s statement marks the dawn of a new era, the ordinary person standing up against authority. It’s a grand moment when an individual ends up standing for something much larger than himself. He fully expects that the Church will sentence him to death as a heretic, as it did the Czech reformer, Jan Hus (who also appeared at a Council under a guarantee of safe conduct). However, the vote is inconclusive. Luther is free, though his life is in danger from the Catholic church, which combined spiritual, administrative and judicial authority (a dangerous situation). 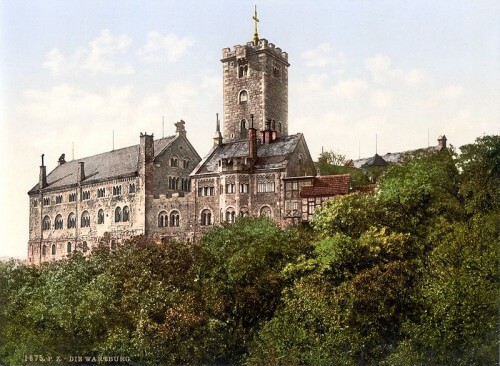 Luther’s patron, Elector Friedrich the Wise now “kidnaps” Luther–using masked horseman– and spirits him away to Wartburg Castle, where he lives anonymously and quietly, hidden away from the world. Going from the peaks of glory, attention and notoriety to anonymity and invisibility is a frequent Christian experience. So Luther goes from the drama and intense experience, the elation and energy of the Diet of Worms to a solitary existence hidden in the Wartburg Castle. He regresses into depression, despair and anguish, introspection and melancholy, and had a strong sense that the devil was tormenting him. And yet again, he snapped out of depression by using the Prozac which had worked in the past: Work. He threw himself into one of his greatest enterprises yet–a translation of the Bible into German, thus making scripture accessible to the common man. 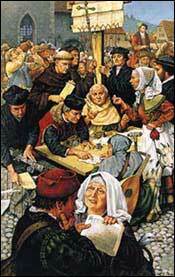 And while he was in the Wartburg, Germany’s Peasant Revolts commenced, sparked by Luther’s ideas and writings. Luther was horrified as he saw the destruction the reformation entailed. His ideas turned out to be more radical than he had realized. Disappointly, he does not support the revolting peasants, but attacks them in vicious prose. “I simply taught, preached and wrote God’s word. I opposed indulgences and papists, but never with force,” he wrote. Luther’s story reminds us of the power of individual charisma, charisma which can travel on the written page. Luther is an elementary force, embodied in language, offering a vision of salvation which is liberating, which resonates, which seems real to so many people. Once you see it that way, you can’t see the world differently. Luther is irrepressible, he is outrageous, he is witty, and very funny. He held onto his sense of rage, and his ear for a good phrase. He remained devoted to his principles, and to speaking out. “When I die, I want to be a ghost, so that I continue to pester the bishops, priests and godless monks so that they can have more trouble with a dead Luther than they had before with a thousand living ones,” Luther wrote. The Redemptive Value of Work in Downton Abbey and Life! Blogging: The Greatest Democratisation of Writing the World Has Seen. Thanks for this, enjoyable and rather entertaining. I would like to watch that video.